Russia's coast guard ships on Sunday carried out acts of aggression against the ships of the Ukrainian Navy that were engaged in planned relocation from the port of Odesa to the port of Mariupol of the Sea of Azov, the Ukrainian Navy said. 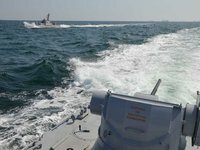 "Today, November 25, the Ukrainian Navy's two small armored artillery boats and a tugboat were carrying out a planned transfer from the port of Odesa to the port of Mariupol of the Sea of Azov. Notification about transfer plans was performed in advance in accordance with international rules to ensure the safety of shipping. However, contrary to the UN Convention on the Law of the Sea and the Treaty between Ukraine and the Russian Federation on Cooperation in the Use of the Sea of Azov and the Kerch Strait, Russian ships – Sobol class patrol boats, the Don coast guard ship, Mangust-class patrol boats, and the Suzdalets corvette – carried out openly aggressive actions against the ships of the Ukrainian Navy," the Ukrainian Navy said in a statement on Facebook on Sunday morning. In particular, it said, the Don mounted a ram attack on a Ukrainian tugboat whose main engine was damaged. It also damaged shell plating and guard railing of the Ukrainian vessel, and its life raft was lost. The Ukrainian Navy states that "the invaders' dispatcher service refuses to ensure the right to freedom of navigation, guaranteed by international agreements." "The ships of the Ukrainian Navy continue to perform tasks in compliance with all norms of international law. All illegal actions are recorded by the crews of the ships and the command of Ukraine's Navy and will be handed over to the respective international bodies," the statement said.